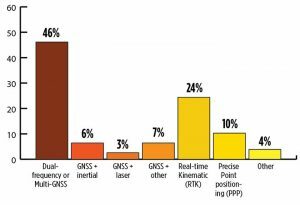 2018 State of the GNSS Industry survey respondents who identified themselves as from the survey sector constituted 30% of the total, corresponding to the percentage of the magazine’s readership. Higher Accuracy. Regarding the most promising technology to get the increased accuracy that surveying continues to demand, the outright choice was “dual-frequency, dual- or multi-constellation GNSS,” with “real-time kinematic” coming in second. Surprisingly, the newest technology to be introduced to GNSS receivers, inertial correction, lagged at just over 5%. Inertial correction devices, which contain gyroscope and accelerometer technology, are now being installed in survey-grade receivers to increase accuracy and productivity. 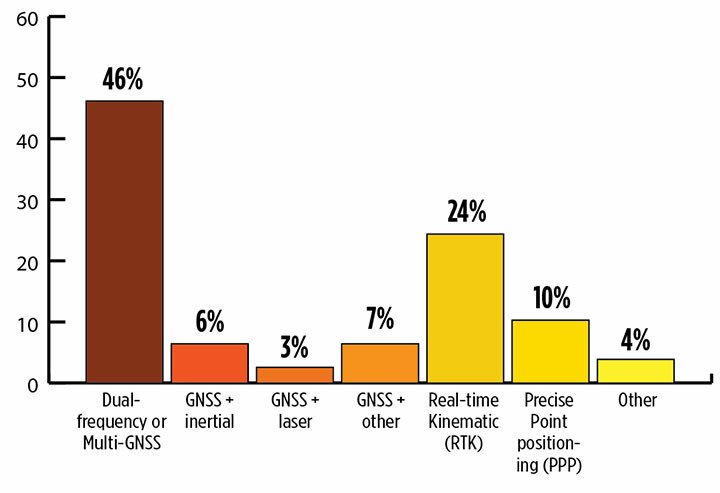 It’s a gamechanger in GNSS data collection for surveyors, so I am surprised by the survey results. These sensors work in conjunction with the receiver to more accurately collect positional information in relation to the point being acquired. While RTK positions are normally collected at 1-20 Hz, the inertial device works in tandem to further refine a more accurate location. As this technology becomes more publicized in phones and other devices, the surveying community will begin to take notice. Drones. 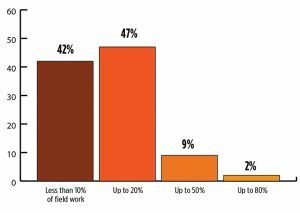 Concerning the role that drones (UAVs) will play in the next three years, by a slim margin — 47% to 42% — respondents state that up to 20% of their work will be completed by UAVs vs. those who feel less than 10% of their work will be done by a drone. 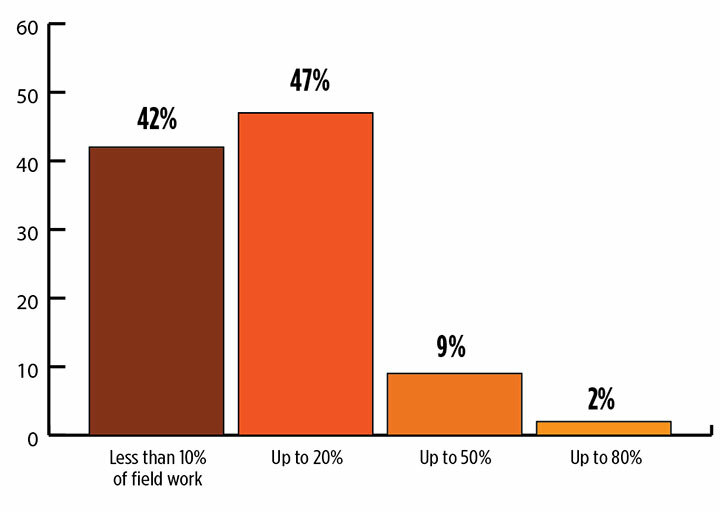 Only1.3% answered that UAVs will take over most of their work and displace surveyors in the field for specific survey tasks. I see UAVs becoming a standard equipment much like the EDM/total station and GNSS receivers, as it is clearly a unique tool for not just collecting visual images but as a remote sensing device. While it won’t replace workers in the field, it will allow crews to become more efficient, tech-savvy and valuable for human-only types of data collection. Business. A whopping 85% of the survey sector found this market either “very healthy, with strong growth” (37%) or “relatively healthy, with moderate growth” (48%). This compares with total of 79% across all GNSS industry sectors. So we’re on top! That is, we are doing comparatively well amid the rest of the GNSS industry — which itself is in very good shape indeed. Poll results reflect the positive nature of the surveying profession in relation to technology, specifically GNSS and the utilization of UAVs, in our every day work. Previously, introduction of new technology has been historically unreliable, less than user-friendly, and expensive. The trend with newer technologies, however, has been quite the opposite with shorter, easier learning curves and lower cost of entry. These factors have led more surveyors to upgrade their equipment, implementing newer technologies and thus creating more efficiency in the profession. TIM BURCH is a professional land surveyor and secretary, Board of Directors, National Society of Professional Surveyors.